Use two different metals and some sour, salty water to create an inexpensive battery. Penny Battery: What's going on? Make a saturated salt solution by adding salt to water and stirring until it doesn't dissolve anymore. Add a splash of vinegar to this solution. Cut your matboard into four 1/2-inch squares, each about the size of a penny. Soak the pieces in the salt-and-vinegar solution. Once the pieces are thoroughly wet, take them out and place them on a paper towel so they are still damp, but not dripping. 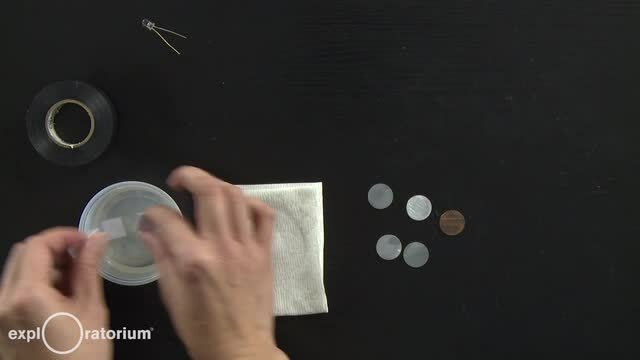 Use sandpaper to remove the copper from ONE side of each of four pennies. Leave the fifth penny intact. Sand until you see zinc (shiny silver color) covering the entire face of the coin. This takes some time and effort, so be patient. 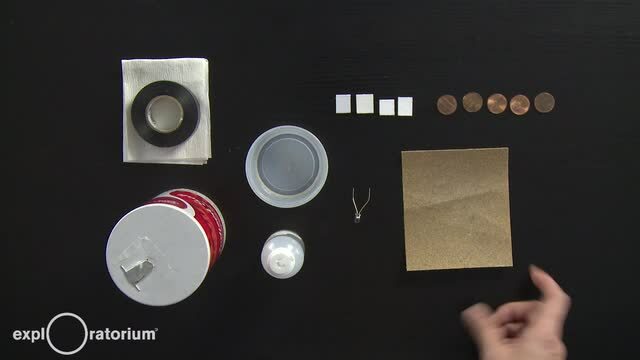 Try placing the sandpaper on a hard surface and moving the penny instead of the sandpaper. The "tails" side may be easier to sand because the Lincoln Memorial (or Union Shield) doesn't protrude as far as Lincoln's head. When you're done, the sanded coins should have a bronze-colored copper side and a silver-colored zinc side. Take one of your sanded pennies with the zinc side facing up (copper side down), and place a damp piece of matboard on it. Then stack another sanded penny (again, zinc side facing up) on top of this. Take your next piece of matboard and place it on top, and continue stacking pennies and matboard on top of each other to make a neat pile. Finally, place the unsanded penny at the very top. When you're done, you should have alternating layers of pennies and matboard with all the zinc sides facing up, and both the very top and the very bottom of your stack (facing down) should be copper. Make sure the pennies aren't directly touching each other and, likewise, that the pieces of matboard aren't touching each other. Test your battery by connecting your LED. Touch the longer lead to the intact penny on the top and the shorter lead to the bottom of the stack. Make sure that the leads don't touch any other layer. Did the LED turn on? If not, make sure the LED leads are oriented correctly and use a paper towel to wipe off any excess water from the penny-matboard stack. 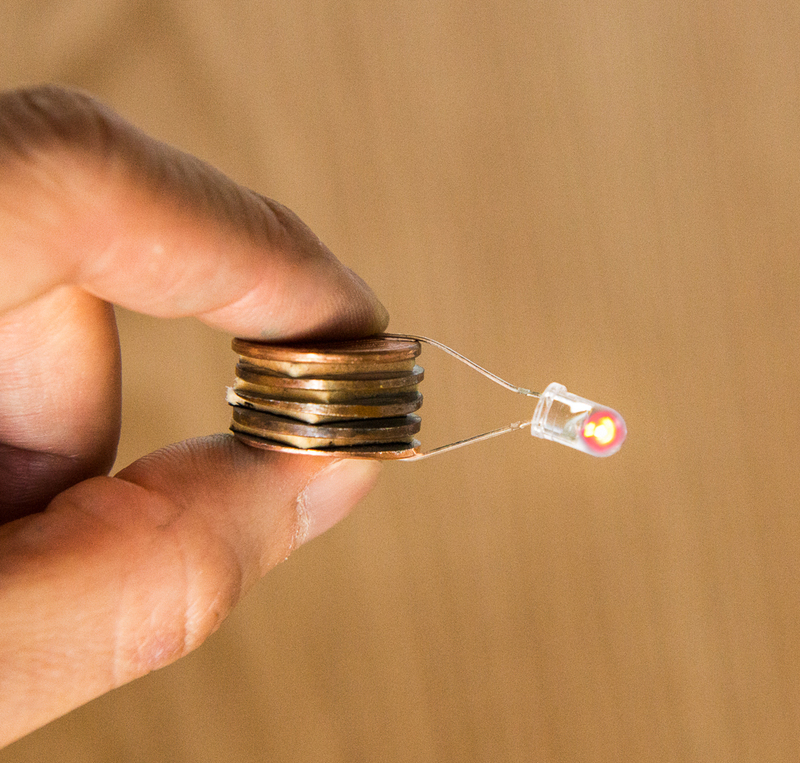 Check the voltage of the battery with a voltmeter by placing the leads on the top and bottom of your penny battery. If you want your LED to stay lit without having to hold it, wrap the entire assembly together with electrical tape. The LED will grow fainter as the matboards dry out, but it should stay lit for 24 hours! To recharge, just re-soak the matboards and reassemble. Batteries are devices that convert chemical energy into electrical energy. When two different metals are connected by an electrolyte, a chemical reaction occurs at each metal surface, called electrodes, that either releases or uses electrons. When these electrodes are connected by a wire, electrons will move from one surface to the other, creating an electric current. Pennies that were made after 1982 have zinc cores that are plated with copper. By sanding off one face of a penny, you create a zinc electrode that can pair with the copper electrode on the face of the next penny. The matboard soaked in salty vinegar water serves as the electrolyte between the two terminals. Each zinc-matboard-copper stack represents one individual cell. By stacking additional matboards and sanded pennies, you’ve created a battery, which is a series of electrochemical cells. This is also called a voltaic pile, which is named after Alessandro Volta, who created the first battery in 1800 by alternating zinc and copper electrodes with sulfuric acid between them. In Volta’s battery and your penny battery, an oxidation reaction occurs at the zinc electrode that releases electrons and a reduction reaction occurs at the copper electrode that uses them. With a voltmeter, you can see that each cell can generate over 0.6 volts. The penny battery you created for this Snack has four cells. A stack of three cells should generate enough voltage to light a red LED, which usually require around 1.7 volts. 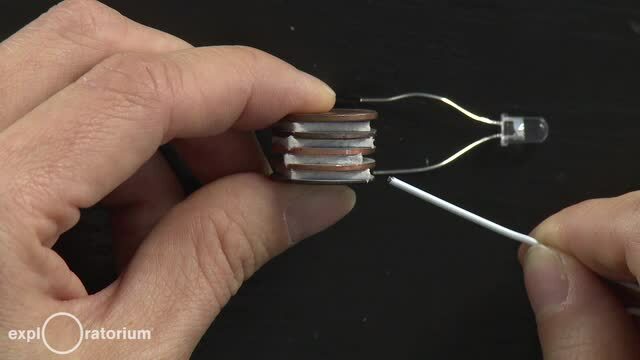 For an added challenge, try making a battery powerful enough to light a blue LED. Before 1982, pennies were made of 95% copper, but the rising costs of copper led the United States Mint to change the composition of the penny. The metal content in a pre-1982 penny is actually worth more than its one-cent face value. Consequently, in December, 2006, the United States Mint implemented regulations that prohibit the melting or treatment of all one-cent coins. Legal disclaimer: The Exploratorium does not take responsibility for any damaged coinage, and certainly don’t try to sell your completed battery for more than 5¢! Use your skin and different metals to create a battery.